May 2016, Brill, 526 pp. Description: The financial markets of Hong Kong and Singapore are leading examples in Asian financial development and regulation. Shanghai, which is developing its Free Trade Pilot Zone, is equally aiming to incorporate a sophisticated service market in order to upgrade, reform and reinvigorate the current economic model of development in China in the aftermath of the global financial and economic crisis. Streamlining administrative regulation is a precondition for its financial market to find root and play a central role in Asia and beyond. 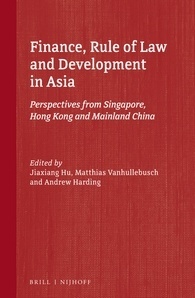 Finance, Rule of Law and Development in Asia offers a contextualized approach to the economic and political realities within Asian financial markets, especially in these three different jurisdictions. The volume adopts a comparative and precise account on the prospects and challenges in further developing these financial centres. "Hong Kong: Evolution and Future as a Leading International Financial Centre"
Abstract: By the beginning of the 21st century, Hong Kong had emerged as one of the world’s leading international financial centres, along with London, New York and Singapore. Its emergence as a major international financial centre is however relatively recent, dating only to the late 1980s. This chapter first considers Hong Kong’s evolution as an international financial centre from the 1800s to the global financial crisis of 2008. It then discusses Hong Kong’s regulatory system and structure before turning to changes to that regulatory system as a result of the global financial crisis. The chapter concludes with a discussion of current and future challenges for Hong Kong’s continuing role as a major international financial centre. "Level Playing Field as an Institutional Challenge to China as a Socialist Market Economy"
Abstract: A new round of reform has been carried out since the Communist Party of China adopted its decision to promote comprehensive reforms for the country’s future development in 2013. However, there are daunting challenges ahead of the reform. In addition to the current economic downturn the ideological and political struggle in the course of further marketization and rule of law development may continue to subject the new campaign to a great deal of uncertainties. Given the imminent threat of the social, financial and ecological crises the party state is facing a dilemma to maintain its political legitimacy or make historical breakthroughs. "Role of the Criminal Law in Maintaining Hong Kong as an International Financial Centre"
Abstract: While criminal law is an essential part of the legal environment used to maintain Hong Kong’s status as an international financial centre (IFC), its role is limited. Criminal law and processes are reserved for serious cases that involve the protection of property rights, economic interests, or the integrity of the financial system. Deterrent and remedial civil processes are increasingly being used as a more effective way to enforce law designed to maintain Hong Kong’s IFC status. "Anti-corruption Law and Enforcement in Hong Kong: Keeping it clean"
Abstract: This paper will examine Hong Kong’s anti-corruption laws and their enforcement by the ICAC, Hong Kong’s dedicated anti-corruption law enforcement agency. The key offences and investigative powers which have enabled the ICAC to successfully prosecute and prevent public and private sector corruption in Hong Kong for 40 years will be outlined and critically assessed. Various lessons learned over the course of the ICAC’s forty years of operation will be reviewed, and some of the challenges confronting the ICAC as it enters its fifth decade of operations will be explored, including legitimacy issues and public trust issues.